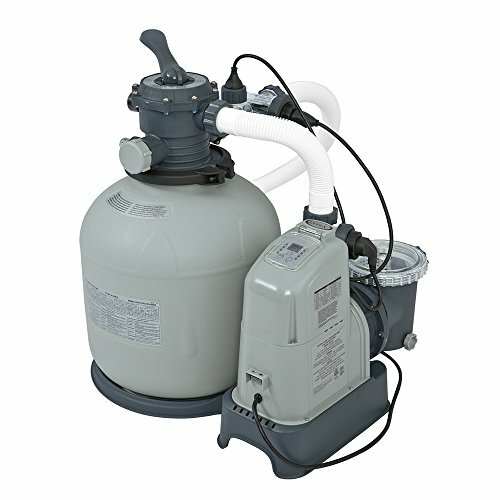 Sand filters are one of the most desirable methods to keep pool water clear and sparkling. Not only does the all-natural, inexpensive sand do an excellent job of filtering the water, it needs replacement only once every five years, making sand filter the easiest maintenance filtration option on the market. Saltwater systems with E.C.O. 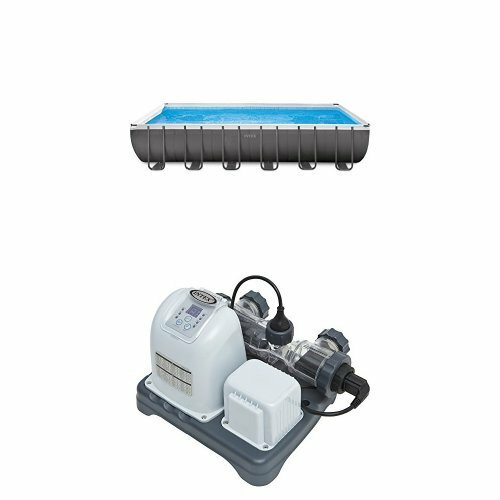 (electro catalytic oxidation) are known for their ability to keep pool water clean and safe, while eliminating the harshness of traditional packaged chlorine. 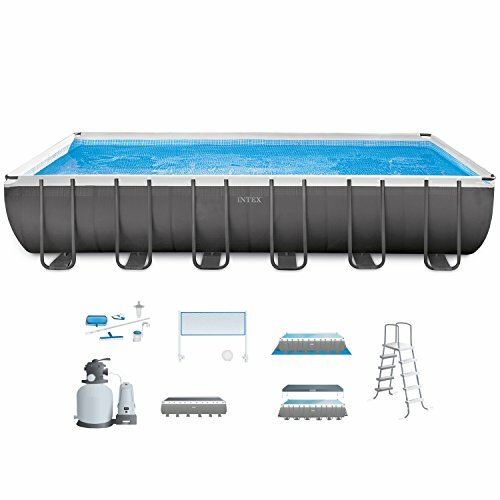 Intex has combined these two excellent systems into one product, providing above ground pool owners with ONE low cost, low maintenance system that will keep pools clean, safe, and comfortable for swimmers. 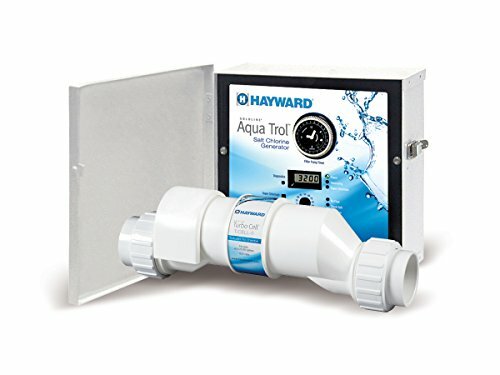 Both systems are controlled automatically with one 24-hour timer to make daily operation care-free!• Designed for use with Above Ground Pools from 4,800 to 15,000 Gallon Capacity. • 110-120V with GFCI (Ground Fault Circuit Interrupter). • 16 and #34; tank diameter. 0.95 hp. motor. • Pump flow rate 2,650 gph. System flow rate 2,150 gph. • 100 lb. sand capacity or 70 lb. glass filtration media capacity. • Chlorine output: 11 g/hr. 2 pieces of 1.5 and #34; (38mm) hoses. • 2-Year Warranty. Titanium electrolytic cell uses environmentally friendly natural salt to create natural chlorine. Soft, fresh, clean water without the potential harsh side effects of packaged pool chemicals. Electro catalytic oxidation splits water molecules into highly powerful oxidants that destroy organic contaminants such as bacteria and algae. Redesigned sleek compact casing and control panel for easy use. 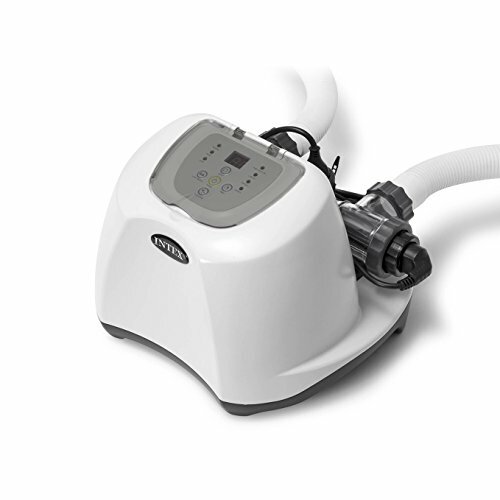 Requires a pump with a flow rate between 700 and 3000 gph. Have an amazing time with family and friends with the colossal Intex Rectangular Ultra Frame Pool Set. 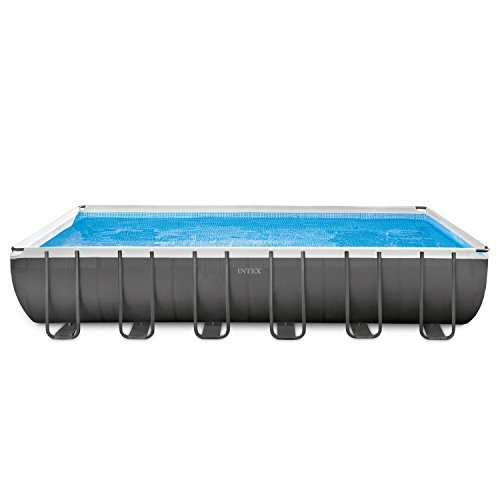 Engineered for strength, the Ultra Frame Pool is supported by strong, durable steel frames which are powder coated for rust resistance and beauty. Your backyard will be the place to be all summer as your family can relax and play. 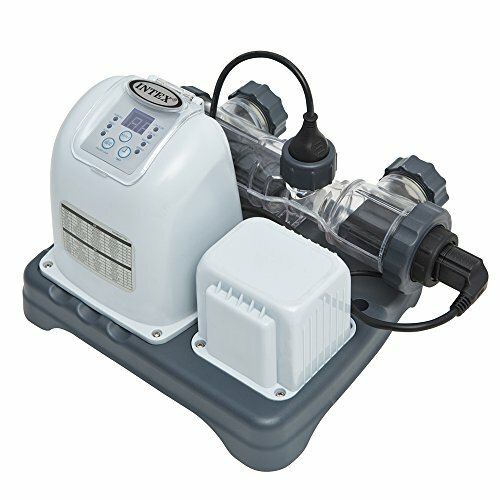 Connect the Krystal Clear Sand Filter pump to enjoy clear, sparkling water. Equipped with the Ground Fault Circuit Interrupter, which is an added safety feature that shuts off the pump if electrical current is exposed to water. Ready for water in 60 minutes, - follow the instructional DVD for easy set up, and enjoy the fun! Water capacity: (90-percent) 8,403 gallons. Includes: Krystal Clear Filter pump and Saltwater System. Ladder. Ground Cloth. Debris Cover. Deluxe Pool Maintenance Kit. Volleyball Set. Set-up and maintenance DVD. SUPER-TOUGH laminated PVC sidewalls. Convenient drain plug that connects to a garden hose so water can be drained away from pool or house area. Have an amazing time with family and friends with the spacious Intex Ultra Frame Pool Set. Engineered for strength, the Ultra Frame Pool is supported by strong, durable steel frames which are powder coated for rust resistance and beauty. Triple strong, SUPER-TOUGH laminated sidewalls are reinforced with an all-around band to keep frame legs firmly in place. Your backyard will be the place to be all summer as your family can relax and play. Connect the Krystal Clear Sand Filter pump to enjoy clear, sparkling water. Equipped with the Ground Fault Circuit Interrupter, which is an added safety feature that shuts off the pump if electrical current is exposed to water. Ready for water in 60 minutes, - follow the instructional DVD for easy set up, and enjoy the fun! Water capacity: (90%) 6,981 gallons. 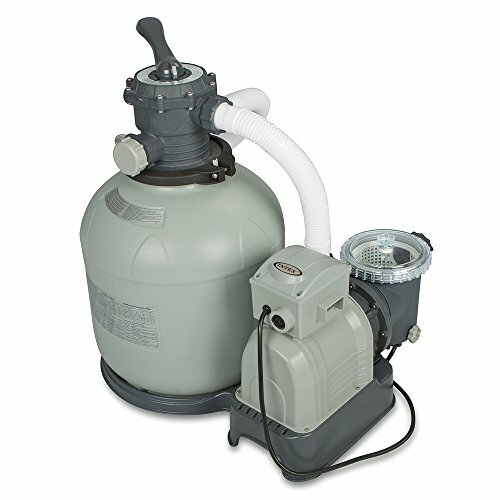 Includes: Krystal Clear Sand Filter pump 2,100 gph (110 - 120V). Ladder. Ground Cloth. Debris Cover. Set-up and maintenance DVD. SUPER-TOUGH laminated PVC sidewalls. Convenient drain plug that connects to a garden hose so water can be drained away from pool or house area. 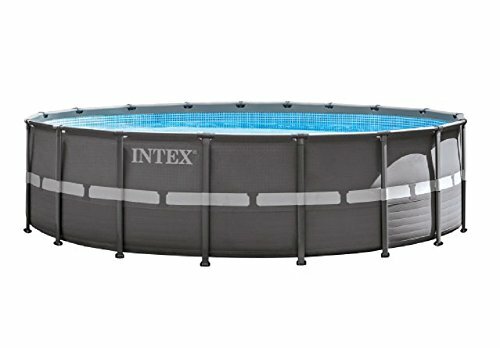 15X48 Intex above ground pool. Saltwater system converion that is working flawlessly!! Thanks for watching. Setting up an Intex above ground pool with a salt water chlorinator and upgraded pump. 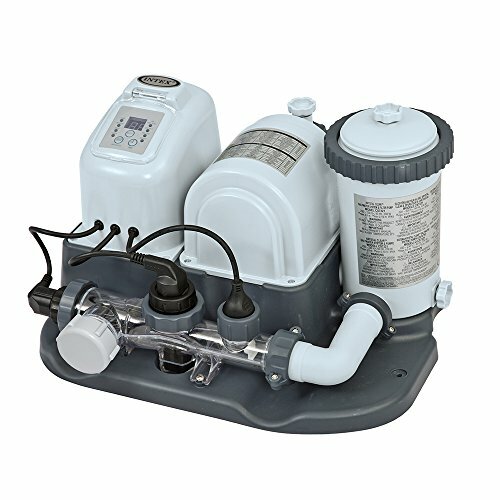 Compare prices on Salt Pump For Above Ground Pool at ShoppinGent.com – use promo codes and coupons for best offers and deals. Start smart buying with ShoppinGent.com right now and choose your golden price on every purchase.